Roseate Spoonbills are among the most beautiful birds found in North America. They are often mistaken to be American flamingos due to their colored body type. These birds belong to the spoonbill family that are distributed largely across the coastal regions of America, Mexico and Caribbean. They are the only spoonbills that live beyond the tropical and warmer climates. Roseate Spoonbills have distinct physical characteristics that set them apart from other wading birds. Their length varies between 28 and 34 inches approximately. Males are much bigger than the females. Its wingspan stretches between 47 to 50 inches. The birds weigh between 1.2 and 1.8 kg approximately. Adult birds display a dark pink tinge on their bodies. Breeding birds change color to greenish on the head along with white underneath, back and neck. Bills have grey shades. Young birds are predominantly white with pink tints at some places. Their legs are reddish but feet are black. Bills appear to be like spatulas, wide in shape and around 6 inches long. Only this species amongst the other spoonbills are widely distributed in the Western Hemisphere. Their range stretches from Central to South America, along with coastal regions of Mexico, Bahamas and West Indies. 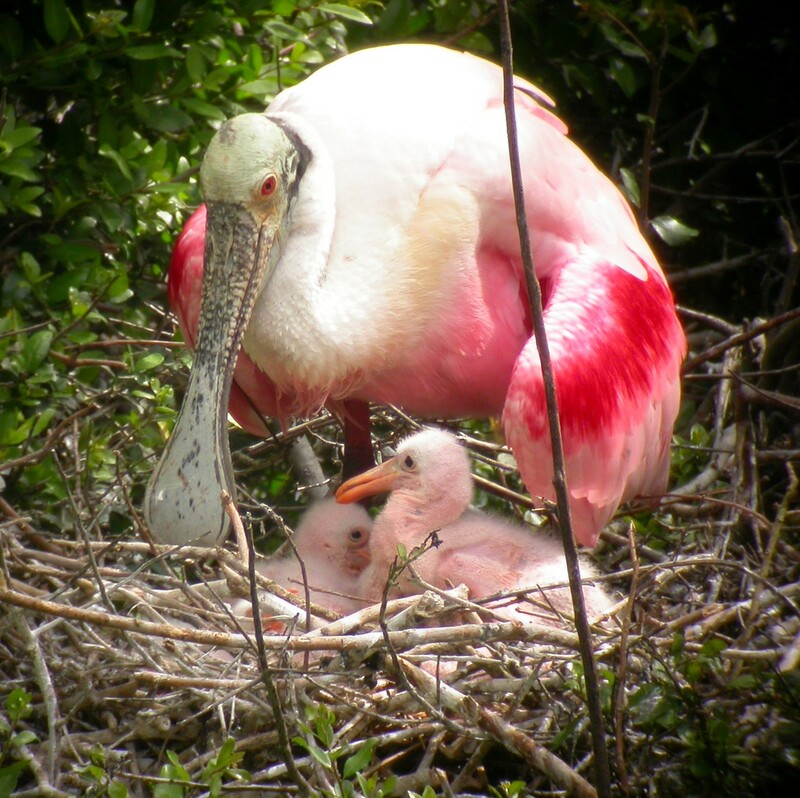 Roseate Spoonbill’s breeding range in USA spreads across Louisiana, Texas and southern ranges of Florida. Throughout their distributional range, these beautiful Roseate Spoonbills inhabit ponds, marshes, swamps and rivers. They can survive in freshwater as well as saltwater habitats, which is why they feed in tidal ponds and estuaries. Shallow water bodies adjacent to their nesting sites are preferred feeding areas during nesting. Breeding habitats comprise islands where they make their nests. Mangrove swamps, sea coasts, freshwater swamps and wet prairies are some more breeding habitats. Nests of these slender birds are made of sticks along with leaves and grasses. Roseate Spoonbills have varied behavioral traits pertaining to feeding, breeding and general living. They have a distinct hunting design which involves swaying the bills while walking slowly in shallow water. They sweep with the bills which allows aquatic creatures lying below to rise up and in turn become their food. It gulps down its prey by pulling it out with the help of its bill. The bird has mandibles that automatically shuts the bill. They are very social creatures living in huge colonies which consist of other birds like ibis, herons, stocks, cormorants, egrets and spoonbills of other types. While flying, they follow a diagonal pattern and stretch their necks and legs out. When the females are ready to breed, they congregate at breeding sites one month earlier than others. In order to pair, the males try to go close to her by flapping their wings and nodding in approval. It eats in the early hours of morning and evenings. To derive nutrition, Roseate Spoonbills consume a diet comprising aquatic invertebrates, small fishes, plant matter and amphibians. 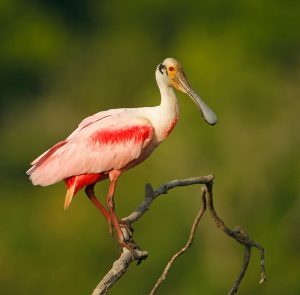 Even the size of the Roseate Spoonbills doesn’t save themselves from the predators present in water and natural surroundings who hunt them for flesh and eggs. Some of them are alligators, pumas, coyotes, raccoons, jaguars, hawks and even humans. Touch receptors located in the bill of Roseate Spoonbill assist it to fathom its prey underwater. Whenever they feel any other aquatic creature inside their mouth they reflexively close their bills. This helps them to survive in the wild by finding food easily in muddy water and also at nights. Long legs help them walk easily in shallow water bodies, keeping feathers and head dry. It can breathe via the small openings in its beak even though it is dipped in water while hunting. Spoon shaped bills help them feed properly. Months between March and June are considered to be the mating season for the Roseate Spoonbills living in Texas. Breeding season of Roseate Spoonbills probably start in the beginning of summer. These Spoonbills enter sexual maturity in the third year but some might take another year to start breeding. A typical cycle can be deciphered which can be classified into 4 phases including, formation of pair, phase of betrothal, copulation and nest formation. After choosing their mate, copulation takes place which results in laying eggs in the nests constructed in thick bushes and trees. A single clutch consists of almost 4 eggs which hatch after an incubation period of almost 3 weeks.. During this time, both the male and the female stays in the nest to keep a watch on them. The hatchlings are fed by their parents who chew the food before giving the juveniles to eat. Cream colored eggs hatch in a month’s time, producing pinkish chicks with orange colored bills. After a month they start flying across low lying branches around the nest but can completely fly after a couple of more months. Till 3 years the young Roseate Spoonbills refrain from mating and above that age they follow the same life cycle like the adults. 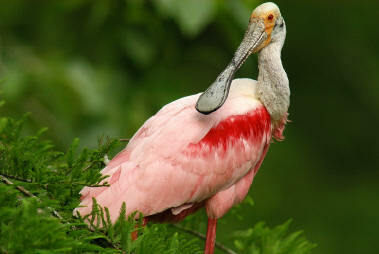 Roseate Spoonbills may live for 10 years or more. No sub-species of Roseate Spoonbills have been reported as yet. 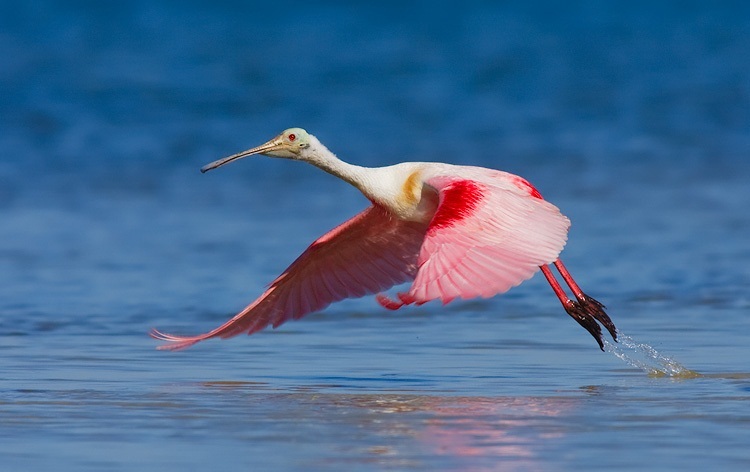 Roseate Spoonbills fly with their head and feet outstretched elegantly looking straight. They form a long line and sometimes that line assumes a ‘V’ shape while flying in a flock. These migrate during the breeding season when they seek partners in distant areas. Migratory range of roseate spoonbills extends to South and Central America during the winters. It however does not travel beyond North Carolina, towards the east. But not all of them are migratory, especially the ones inhabiting the tropical zones. Roseate Spoonbills are usually quiet but make low grunting sounds while they are eating with others. Young ones emit soft calls unlike the adults who have a raspy voice. The roseate spoonbills can make adorable pets. Provide them a large body of water in your backyard surrounded with vegetation. It is commonly raised in captive in several United States zoos. You can feed Roseate Spoonbills with small aquatic creatures and fishes. Save them from excess cold and frost. In the 19th century laws have been passed to prevent the killing of Roseate Spoonbills as they were becoming endangered during that time. There are no issues with its population now and hence at present IUCN lists them as Least Concern birds. In Louisiana and Florida they have been enlisted as Species of Special Concern. Here are a few amazingly interesting facts about these birds. Pink color of the birds is bestowed by their food which contains canthaxanthin and astaxanthin, both careotenoid pigments. While rearing their juveniles and during breeding, these colonies act as protective shields in many cases. 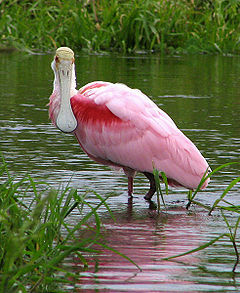 Roseate Spoonbills rely on their sensitive bills than sight for feeding. A 16 year old bird was earlier discovered to be living as the oldest among them. In the breeding season, their plumage attains a bright color. It is not an easy task for them to hunt as they face stiff competition from American White Pelicans, Snowy Egrets and other birds. Look how beautiful the Roseate Spoonbills look through these pictures.